Since 1933 we have become the industry standard for designing and producing quality grade plumbing products and fixtures. Our role as an industry leader remains unsurpassed. Just Manufacturing provides the utmost quality, while ensuring flexibility for creative design and optimal aesthetics. From hospitals to schools to a variety of university complexes, Just stainless steel sinks and plumbing products enhance both form and function in significant construction projects around the world. 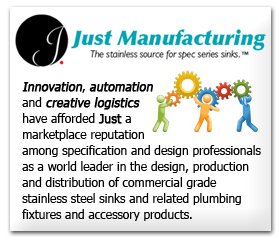 Just Manufacturing has made its mark as a comprehensive manufacturer of high-quality, commercial stainless steel sinks and residential stainless steel sinks and plumbing fixtures. What makes Just Manufacturing unique in the industry is its ability to produce custom, application specific plumbing products for varying purposes (heavy and light commercial, sustainability enhanced aesthetics, institutional and residential projects). Nothing sets a building apart like the creative use of plumbing fixtures. At Just Manufacturing, our plumbing products do more than just look good – they also pay for themselves. Engineers and Architects commercial project spec preferences have made Just the preferred commercial brand. Quality and durability are an integral part of our reputation. Our stainless steel plumbing fixtures and custom products have value added special feature that are specific to end user needs include: the most comprehensive size and model offering in the market, application specific ADA compliant sinks, overflow, vandal resistant sinks, and Lead free certified products. All Just fixtures are ARRA and Made in USA. Let our experience work for you. Call us today to speak with our specifier services about designing Just products into your next project.